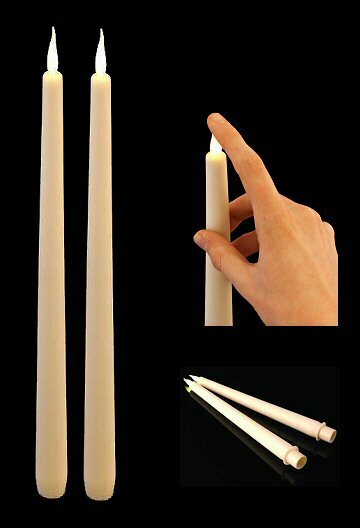 Electric battery-operated LED tapered dinner candles with a warm white flicker, pack of 2. Batteries included. These dinner candles are great fun! Batteries are already fitted. All you do is press down on the candle flame to switch on and marvel. Smart Candle technology uses intelligent electronics and LEDs to generate a long-lasting, realistic light that perfectly simulates a wax candle flame. Every Smart Candle creates a stress-free way to experience and enjoy an inviting, ambient light. Being lit using LED technology, which is a non-heat generating form of light, these candles pose no fire risk. The candles are clean, maintenance free and create no smoke, soot or dripping wax on tablecloths. They will also not blow out in the wind. They are made from silicon, which makes them remarkably realistic and generally resistant to breakage if they should ever fall on the floor.